I thought you’d like a page that has all of the resources I use and recommend for my own podcast and related podcast websites. I’ve divided things up into sections with a brief explanation of each resource. Disclosure: some of these links are affiliate links. This means that if you decide to purchase through one of these links then I will be paid a small commission at no extra cost to you. Thank-you for supporting my work. Buzzsprout: This is the # 1 “one stop” approach to podcasting. Upload your audio here, and then just integrate with your wordpress blog / website in a few easy clicks. Gotta love easy. Blue Yeti Microphone: This is the BEST USB microphone on the market in my opinion. This was my very first podcast microphone and I continue to use it today as part of my overall set-up. Sennheiser HD 202 headphones: An excellent pair of headphones for the price. I used to use these in my career as a Radio DJ. This is one case where you pay very little but get so much in return. Heil-PR 40 microphone: If you want a microphone that will have you sounding like a PRO from day one then you need this top of the range unit. Made in U.S.A, the Heil PR-40 is one of the best dynamic microphones on the market. Libsyn: I use libsyn to host the audio for my podcasts. They have cheap plans and have excellent statistics. A must for any serious podcaster. Behringer XENYX 1002: This is a small mixer board that gives you great control over your audio and the room to grow and add other microphones to your podcast. I think the price tag represents great value. I’ve got one myself and recommend it to others! WordPress: All of my podcast sites are using the WordPress platform. Very easy to use and customize. Optimize Press Theme: Optimize Press is a fantastic theme for wordpress, that let’s you build a website in minutes. I’m not kidding. I use this theme on all my podcast sites. HostGator: I use hostgator to host some of my websites. They are very reliable, cheap and have fantastic customer support! Nanncast: I sell a lot of products using my podcast and I need a shopping cart I can depend on. That’s why I use Nanacast. They integrate with paypal and you can create one off payments, membership sites and so much more! 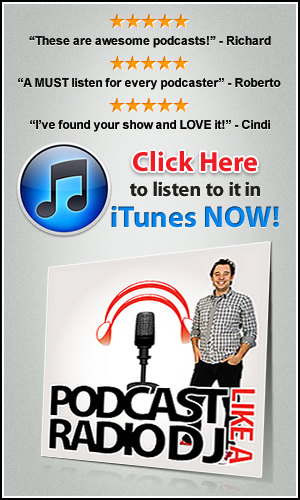 Very powerful stuff that I recommend you get if you want your podcast to start making some $$$.